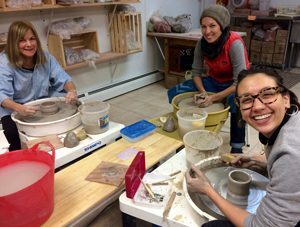 Centered on the art and craft of ceramics & clay, Yonkers Pottery Studio is a full service pottery school serving lower Westchester County & Bronx and northern Manhattan neighborhoods. Encouraging a warm and relaxed environment to inspire creativity, we offer hand-building, sculpture, and wheel throwing instructional classes for all ages, beginner to advanced students, as well as birthday parties (for children and adults), corporate team building, craft workshops, and studio space rental for experienced potters, sculptors, ceramists and clay artists. We offer daytime, evening, and weekend classes to fit your schedule. Our studio is well equipped, teachers are skilled, dedicated artists and class size is small to ensure every student gets the attention they need to grow their clay skills. Fridays, 7-9pm (Clay Soirée) – *not a series class, most Fridays — see page for dates. Sundays, 12-4pm (Pottery 101) – *not a series class, once monthly –see page for dates. Get your children together with their friends and school classmates! In FOUR 1.5 hour pottery making sessions we will explore handbuilding, sculpture, and wheel throwing by completing fun, engaging clay projects. Each class is designed for your children and scheduled to meet your needs. Teachers work exclusively with your group. CONTACT US to arrange a private series class session.